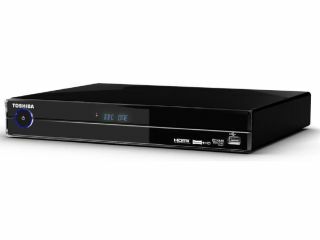 Toshiba has announced a new PVR capable of recording Freeview HD streams for the UK. The new HDR5010 has a twin Freeview HD tuner and Freeview+ HD capability - allowing users to watch and record HD channels simultaneously. The box is packing 500GB of internal storage, which should be good for 120 hours of HD recording, and there are three HDMI slots with two USB sockets too. It's also got an Ethernet port too, for viewers wishing to take advantage of 'new digital interactive features' if that's your bag. Toshiba is making a big deal about how glossy and lovely the HDR5010 is, as well as the masses of storage on offer - so if you think a UK price of £350 is fair for this box, perhaps you should clear some space under the TV. It's been given a UK release date for June this year, so we'll be looking forward to walking into our nearest outlet and asking 'good sir - hast thee the HDR5010?' just to see if they know their model numbers.